afore an efter Warld War II. Cawin code +42 wis retired in the winter o 1997. 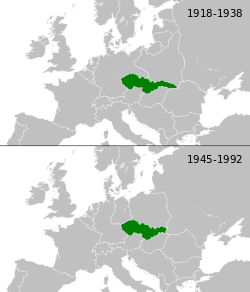 The nummer range wis subdividur and re-allocatit amangst the Czech Republic, Slovakie, an Liechtenstein. Czechoslovakie (or Czecho-Slovakie; Czech an Slovak: Československo, Česko-Slovensko) wis a sovereign state in Central Europe that existit frae October 1918, when it declared its unthirldom frae the Austro-Hungarian Empire, till its peaceful dissolution intae the Czech Republic an Slovakie on 1 Januar 1993. ↑ "Ján Kačala: Máme nový názov federatívnej republiky (The New Name of the Federal Republic), In: Kultúra Slova (official publication of the Slovak Academy of Sciences Ľudovít Štúr Institute of Linguistics) 6/1990 pp. 192–197" (PDF). This page wis last eeditit on 24 Januar 2019, at 01:46.